Joel Osteen’s stadium-sized Lakewood Church. If you skipped a service like this, would anybody notice? "People have an increasing detachment from religious organizations, and, somewhat counter intuitively, mega-churches are a reflection of that," said David Eagle, a postdoctoral researcher at Duke's Center for Health Policy and Inequalities Research. "These churches are really large – with more than 2,000 people in attendance. By nature they are more anonymous places – your comings and goings aren't noticed from week to week and you may not face the same encouragement—or pressure—to attend as in a smaller church," Eagle said. 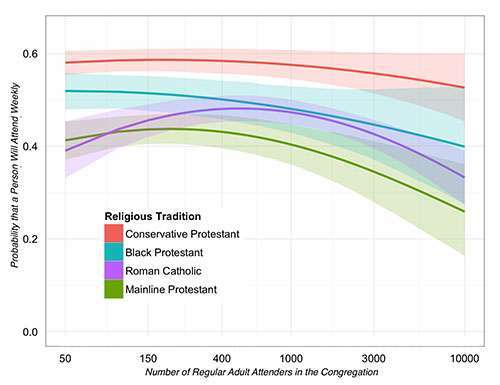 Across the religious spectrum, Eagle's study found a reverse correlation between church size and attendance of its members. For example: about 40 percent of members of white, mainline protestant churches with a membership of 50 people attended services each week. But at a far larger white, mainline Protestant church of 10,000 members, just about 25 percent attend weekly services. There are other factors at work as well, Eagle said. Families with little free time are more apt to attend large churches where they can pick and choose their involvements without feeling obligated to take a leadership role, he said. Eagle's study, which examines mainline protestant, black protestant, evangelical and Roman Catholic churches with as few as 20 members and as many as 25,000, analyzes data from the U.S. General Social Survey and the National Congregations Study, the latter led by Mark Chaves, a Duke professor of sociology, religion and divinity. During political election cycles, many wonder about the political influence that megachurch pastors might exercise from the pulpit. But those pastors may struggle to reach their members, given the tendency for attendees of those larger churches to attend only sporadically. And in larger churches clergy often shy away from expressing extreme political stands from the pulpit, Eagle said. "If you have 10,000 people in your pews, it's less likely that everyone is of one political persuasion."